oldest wine The earliest evidence of wine making comes from China: traces of a fermented drink made with rice, honey, and either grapes or hawthorne fruit found in Jiahu and dated to 7000 B.C. 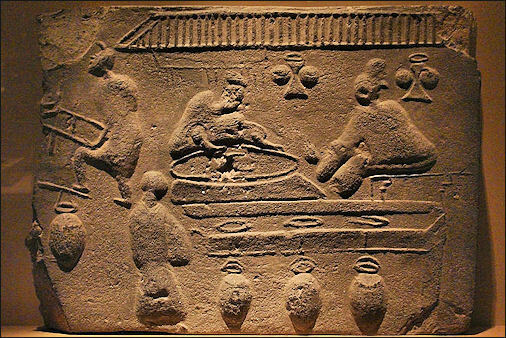 The previous earliest evidence of wine making comes from artifacts dated to 5400 B.C. from Firuz Tepe in Iran. Analysis by University of Pennsylvania's Museum of Archeology and Anthropology of the pores of 9000-year-old pottery shards jars unearthed in Jiahu turned up traces of beeswax, a biomarker for honey; tartaric acid, a biomaker for grapes, wine and Chinese hawthorne fruit; and other traces that ‘strongly suggested” rice. There is some debate whether the concoction was a wine or a beer or something else. Grapes were not introduced to China from Central Asia until many millennia after 7000 B.C., so it is reasoned the tartaric acid likely comes from hawthorne fruit which is ideal for making wine because it has a high sugar content and can harbor the yeast for fermentation. Wine traces has also been found in a pottery sample from a Chinese tomb dated to 5000 B.C. Signs on 8,600-Year-Old Jiahu Tortoise Shells: World’s Earliest Writing? “But Professor Keightley did say the signs appeared to be highly “schematised” or stylised. This is a feature of Chinese written characters. Aggregations of small pebbles were found close to several of the tortoise shells. The Jiahu researchers propose that the shells once contained the pebbles and were used as musical rattles in shamanistic rituals. In one grave, eight sets of tortoise shells were placed above the skeletal remains of a man whose head was missing. The shells come from graves where, in 1999, the researchers unearthed ancient bone flutes. 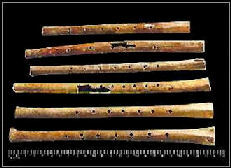 These flutes are the earliest musical instruments known to date. The oldest playable flute, a seven-holed instrument carved 8,000 years ago from the hollow wing bone of a large bird, was unearthed in Jiahu. It and other bone flutes were found in the late 1980s but were not described in the West until 1999. The flutes were cut, smoothed at the ends, polished and finally drilled with a row of holes on one side. One of the broken flutes was repaired by drilling fourteen tiny holes along the breakage lines and then tying the section together with string. For a while the Jiahu flutes were declared the world's oldest flutes and musical instruments, but in June 2009, a 35,000-year-old bird bone flute found in a cave in Tuebingen, Germany was declared the world's oldest flute. In 2012, a 40,000-year-old bird bone flute from the site of Geißenklösterle, a part of the Swabian caves system in southern Germany, was declared the world’s oldest flute and musical instrument. Jiahu villagers practiced some unusual burial customs. In some graves the heads were severed from the body and pointed towards the northwest. Cut marks made when the bones were fresh indicates the heads were cut when the person was still alive or shortly after they died. Adults were generally buried whole in pits; juveniles were buried in pots. Most were buried in individual plots. Some were buried in groups up to six with a mix of sexes and ages.